With the new year looming, I'm seeing so many bloggers talking about their targets and changes for 2016 but have you thought about the reasons that someone won't come back to your blog? I don't want this to be a super negative post, I'm not saying that if you do these 5 things people won't come. 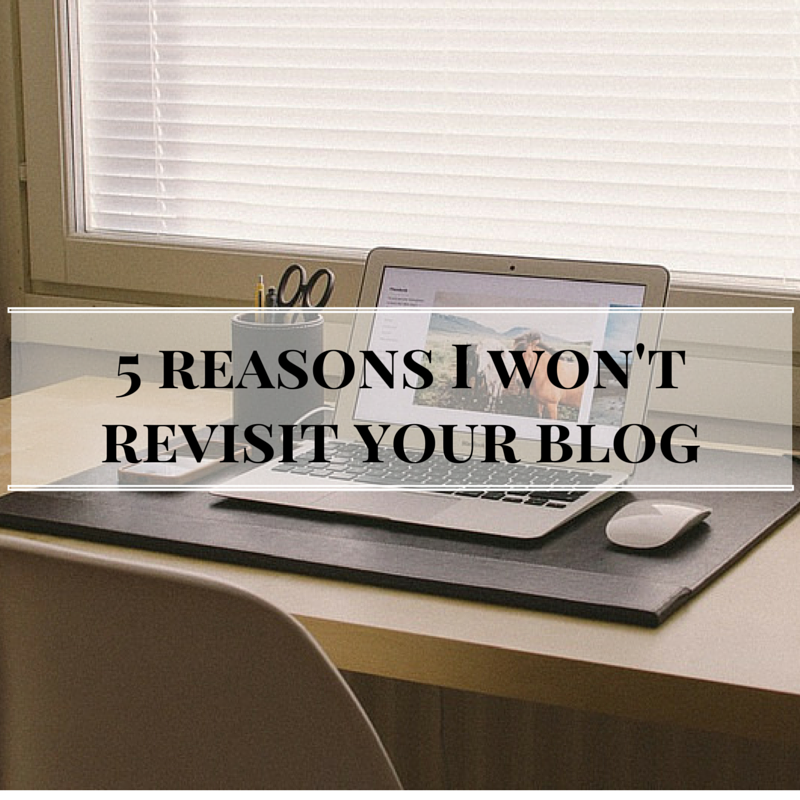 It's a totally personal thing but these are the top 5 reasons I won't return to a blog! Your trying to read something and a little box pops up and tries to get you to join the mail list. Don't get me wrong, it's a great idea, if you can get them to go away. If I'm interested in the blog chances are I'll sign up but nothing annoys me more than the ones that you can't close. I will simply close the website and move on to another who has a similar subject. Blogs that haven't got responsive layouts drive me crazy. They always take forever to load and lets be honest there is nothing more annoying that trying to scroll down a page and it bouncing everywhere because it hasn't loaded. I am rather impenitent with internet download speeds but this drives me insane! If I'm really interested in a product, I will go to blogs and find reviews. I love reading them and it's saved me a fortune over the years! I do however, love a review that does point out a products flaws. No product is ever going to be perfect, you may have found the perfect lipstick but I do want to know if it needs reapplying every half hour to keep that colour or if that mascara does make you eyelashes 1000 feet long but takes an hour to take off. I love nothing more than an honest review! What is it with blogs that do not disclose when they get an item to review?! It doesn't mean anyone's going to think any less of the product or your review but it does let your readers know that it might not have been a product you would have brought yourself. No way am I suggesting everyone needs to be a trained or highly skilled photographer, what I am saying is just make sure they are clear! Use whatever camera you have but please try to make sure they are bright and true to life. I hate massive un-cropped, dark photos. They take forever to load, take up loads of room and when I still can't see what the colour actually looks like, what's the point?! Do you have reasons you won't revisit a blog? I think with so many blogs on the market, the smallest inconveniences and people just won't bother! I definitely need to sort mine out but these tips have given me things to remember to avoid!! I HATE the pop ups. Even if they can close, they still put me off. Why would I sign up to the newsletter of a blog I haven't even read yet? I don't mind the ones that pop up after you've been on the site for a few minutes, that doesn't bother me as much, but the ones that pop up straight away drive me crazy. Non Disclosure is awful, I don't see why anyone would think it was okay to do that- especially as most people don't even care if you've been paid or sent the product! I've been trying to improve my photography recently, hopefully it will pay off haha! I agree with everything here. I try to make sure that my blog loads fast through a series of optimisation work I do with plugins and server caching. However, I've found that things like Google Adsense do tend to slow my blog down but I rely on part of it to keep my blog alive. I've tried to get email subscribers throughout being obtrusive by putting my email subscribe box in my sidebar. I hate those that appear over the top of the content, especially ones that ask you to like my Facebook page without me ever reading one word on your blog.